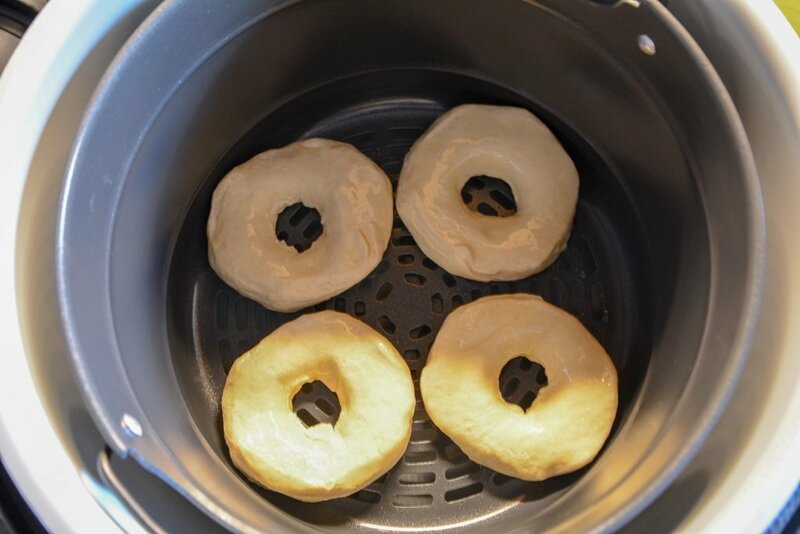 Ninja Foodi Air Fryer donuts are warm, flaky, and made in a hurry! 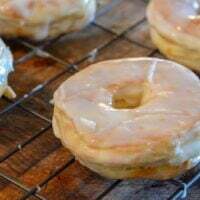 Grab that can of biscuit dough and let’s create quick and easy homemade donuts to curb that craving! If there was ever a reason to own a Ninja Foodi or Air Fryer, this recipe is it. You get donuts made without dropping in grease. A little oil for coating on the basket to prevent sticking is it. You will have they slight crispness on the outside of the donut like it had been deep fried! The Ninja Foodi and Air Fryer cook in an incredible way! Because you are using biscuit dough it makes this recipe a breeze! 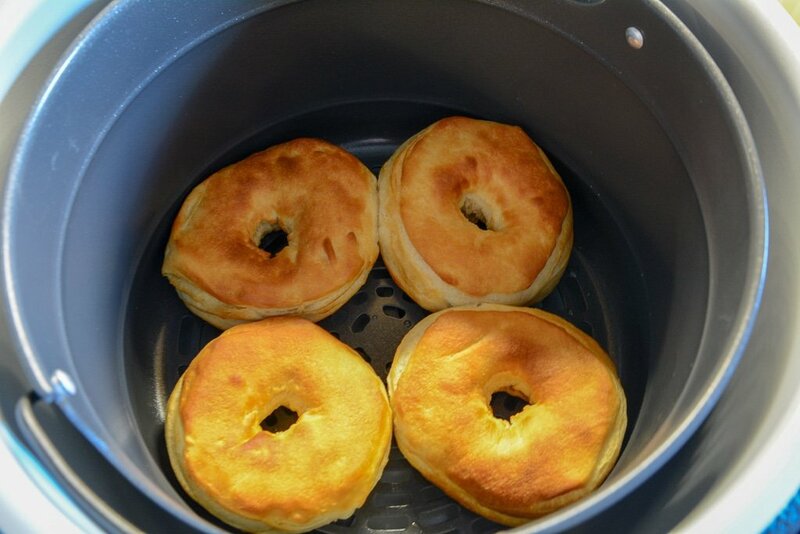 The Ninja Foodi and Air Fryer both work in the same way (when crisping lid is on Foodi). Hot air circulated heating the item in the basket fast. 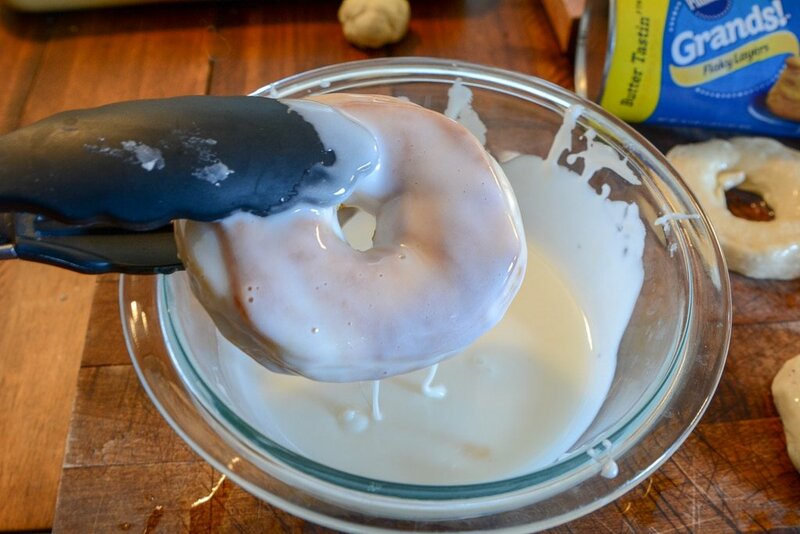 This is what gives your donuts that deep-fried texture without any grease. It’s pretty incredible! Don’t have a cookie cutter small enough? That’s ok! Look around your kitchen for something circular, like a shot glass, small cup, or bottle cap. Looking for ways to dress up your homemade biscuits? 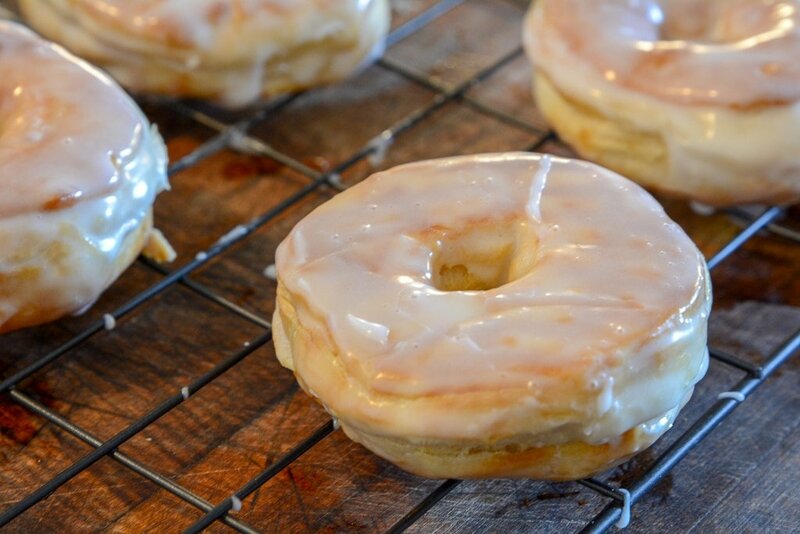 Here are a handful of ideas of how you can top your pretty homemade donuts! Truly the options are endless! Depending on our mood will depend on what I roll our warm donuts in or top them with! Not really. Just like any other “fried” food, it is best served fresh. If you put any sugar on the donuts it kind of melts as time goes on. These canned biscuit donuts are best when served warm. You can save leftovers but they won’t taste near as good as day one. Cook it of course! Make little bite-size donut holes for kiddos or yourself. Just lower cooking time so these smaller dough pieces don’t overcook. What’s amazing here is both machines work the same. 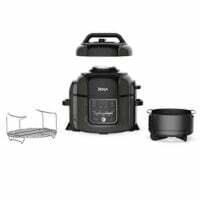 The Ninja Foodi is an Instant Pot and Air Fryer in one essentially. You simply change out the lid for each method of cooking you want. So if you are looking to invest, just think would you benefit from a pressure cooker as well, or maybe just want Air Fryer only. Either way, both the Air Fryer and the Foodi are both highly recommended in my book! Looking for more Ninja Foodi or Air Fryer Recipes? You may want to try my 2 ingredient Bagels or Cowboy Casserole. Cook at 350 on air fry for 4 minutes. 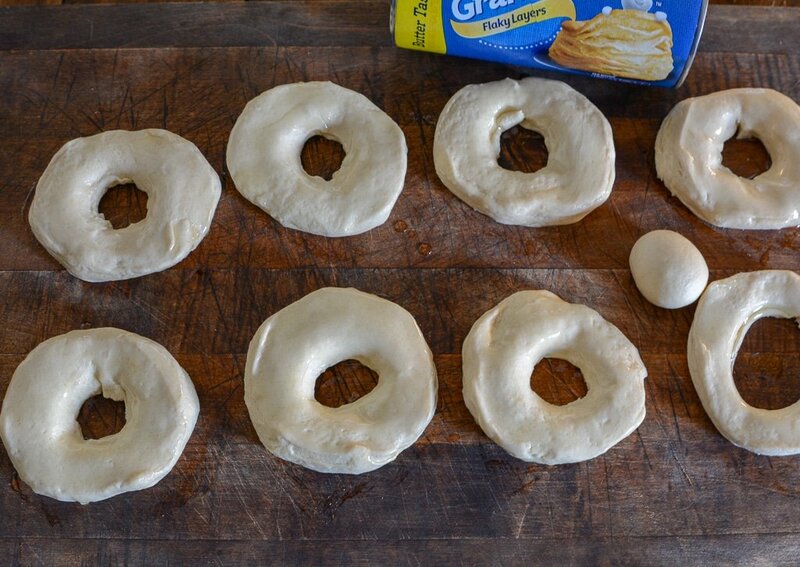 Dip each donut in the glaze and set on a wired rack.